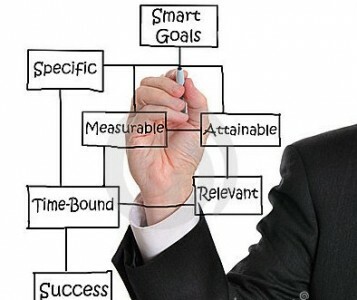 In business, every company has certain levels of accumulated energy; this energy fluctuates during the business calendar activity, its inconstancy is because of the human factor. It is a fact that companies have a momentum of inertia, I often describe this as “Management Traction” and therefore this traction of inertia is the result of adaptability and the daily challenges faced by the management team. The amount of energy stored in a company is proportional, or should be, to the speed and accuracy of decisions made every day. For example, when a sales representative is not acting quickly enough to respond to an enquiry, businesses lose a potential energy (commonly named revenue), which results in a decrease or lack of traction. The energy gained by the management team, through employees in the organisation, is the result of being constant in time and working on four core values, all of which are part of the 360 SMART flywheel. It has the ability to provide continuous energy when the management team loses direction or traction. For example, when the team start to lose motivation or drift away from main targets, the flywheel serves as a guide to re-focus on what is primarily important. It has the ability to deliver energy at a high level, as a result of focusing on employees, guests, quality and financial aspects of the business. It has the ability to control the direction of the company, for example when scores show signs of people disengagement or guest dissatisfaction, the flywheel is a powerful management tool that can gain direction and consequently re-gain management traction. 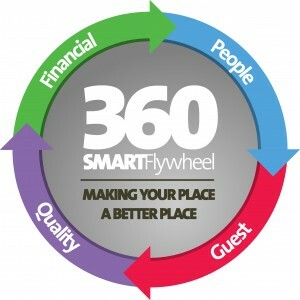 We want to have a good understanding of your products and services, which is why we have developed our unique 360 SMART flywheel. By focusing on four main key core areas, this management tool allows us to understand (or thoroughly comprehend) your service life cycle. This can then help to plan out how to make your organisation engage in a medium/long term strategy, and successfully foster a great place to work. We strongly believe that a 360 SMART flywheel strategy is more than just a motivational slogan, although it also plays that role. It is a way of doing business, which places core businesses at the heart of any company’s strategic thinking. In business we make daily decisions which all come with different outcomes, with behaviours in mind such as ‘Doing What is Right’, ‘Aiming Higher’, ‘Can Do’ attitude and ‘Working Together’ will help any decision maker to build the right path to “make your place, a better place”. We at Hoteliers Inspiration work closely with hotels and hospitality organisations to ensure they are optimising their resources, focusing on employees, guests, financial and quality aspects of the business. We enjoy creating value in every project, with a unique mindset of “making your place, a better place"!